New Features | Personalizing | Privacy Concerns | Security | Should You Upgrade? Lost files in the Windows 10 October 2018 Update? See your recovery options. In short, Windows 10 is good, but it isn't a slam dunk — and it comes with considerable baggage. On the other hand, if your machine, drivers, and apps are compatible (most likely they are), you want to ride the wave of the latest and greatest, and you're willing to accept the new Windows-as-a-service world of forced updates and Google-like data collection, you will probably be happy with Windows 10. Windows 10, released on July 29, 2015 with support ending October 14, 2025. Microsoft added a wrinkle: support is only valid for the supported lifetime of the device which is undefined by Microsoft. More than likely the hardware is going to determine the supportability of your computer. As it ages and newer technology emerges it is likely that support for legacy hardware will be removed and your computer could become unsupported. However, Intel may be building a new version of its Coffee Lake chipset just for Windows 7. Windows 10 will not upgrade older systems including those running the Atom processor-based systems past the Anniversary Update (video). Device support can be affected by the manufacturer's discontinued support for hardware, including the loss of support of a component within your system. Windows 10 is a “mobile-first, cloud-first” hybrid of Windows 7 and 8. It is a single operating system capable of running on every device from Windows Phone to Xbox to the 84-inch Microsoft Surface Hub conferencing system. Windows 10 is designed as a single operating system running on any device in 12 different editions. Downgrade rights is the terminology Microsoft used to allow users to run an earlier version of Windows using the license for the current version. Downgrade rights for Windows 10 — licensing how-to. Downgrade Rights — Microsoft Download Center is a direct PDF download from the Microsoft Download Center. The Start menu has been restored — sort of. The open Start menu in desktop mode. Many non-touch users have opted to ignore these pinned apps (even removing the default pinned icons) and pinning their favourite program icons onto the desktop. Has your Windows 10 Start menu stopped working? How to fix it. Windows 10 is Software as a Service (SaaS) — software running on the Internet. Upcoming changes to Windows 10 could change it from a fixed desktop experience to one that is virtual and which has additional fees. Given the frequent updates failures, do you really want Microsoft to manage your desktop for you? Microsoft is getting ready to replace Windows 10 with the Microsoft Managed Desktop. This will be a "desktop-as-a-service" (DaaS) offering. Instead of owning Windows, you'll "rent" it by the month. If Microsoft continues on this course, soon your only real choices if you really want a "desktop" operating system will be Linux and macOS. DaaS may only be for enterprise uses at this time, but it may show up on Home and Pro editions once the Microsoft alternatives to Windows 10 have expired. Service Packs are a thing of the past, replaced by an “all or nothing” approach to updates. Windows is a continually evolving project with a cycle that changes every 18 months rather than every decade. Dear Microsoft — a sysadmin's wishlist. The world is changing rapidly. The proprietary desktop scenario of Windows XP, Vista and 7 has been replaced with “bring your own device” in many workplaces. People are more mobile and many want to access all their information on the go. Windows 10 was designed to meet the needs of the mobile user. Windows 10 does allow you to move quickly between devices, but you sacrifice your privacy for this ability. Windows 10 is a cloud-based operating system hybrid. Placing your data “in the cloud” provides the ability to stop working on one devices and resume on another. Users can move between desktop and mobile devices as needed without losing productivity. Of course, this also means that you no longer have direct control of your data and it is accessible to anyone anywhere in the world if your password is compromised (and probably without compromise to the cloud storage facility staff). For example, when you do a search for a local document or file on your Windows 10 computer, Microsoft sends the information about your system files up to their servers and does the search there. That's what it means to be a cloud-based Windows system. That might not make sense unless you consider two things. First, it would allow for thin-client integration (computers that depend upon the cloud-based server to function) and it would provide more information about the sorts of files you have on your computer. Windows 10 is designed to take advantage of newer hardware and enables futuristic technologies like holographic computing, biometric login and 3D printing. Additional features are added with each Windows 10 Update (now named by the release date). See the Windows 10 update history for details of all the updates to Windows 10. PCWorld 's Windows 10 review provides a decent overview of the new features when Windows 10 was initially released including some useful hints on getting the most out of the new OS. Cortana (a digital assistant) and Microsoft Edge (the replacement browser for Internet Explorer) were the most notable new items. Several of these new features will require you to sacrifice at least some of your privacy to benefit from them. The monetization of Windows includes ads and the subscription fees to get rid of them but also the collection of personal data (meta data). Be sure to backup your files before updating Windows. Acronis True Image is strongly recommended for backing up your system (I use it for both Windows and Mac systems). The Anniversary Update was released a year after Windows 10 launch (and just after Microsoft closed the free upgrade option for Windows 7 and 8.1 users). The Creators Update (Spring 2017) was designed to spark and unleash creativity, bringing 3D and mixed reality to everyone and enabling every gamer to be a broadcaster. The Fall Creators Update (Fall 2017) completed some of the work started with the Creators Update and focused on the ability to move between devices when working on projects (even to and from Android and iOS apps). The Spring 2018 Update (1803) included the Timeline feature and the ability to share content with other computers via Bluetooth or WiFi connections. The New Application Guard (Pro only) protects against Ransomware. Windows Update failed? Here are 10 fixes you can try. The Windows 10 October 2018 Update (1809) includes the delayed Cloud Clipboard, dark-mode File Explorer and other tweaks. Windows 10 October 2018 Update: The 7 best new features. Unfortunately many folks unexpectedly lost files during the update process, so Microsoft pulled the update. The Acronis blog has more. I strongly recommend you backup your system before installing any Windows Update (especially with Windows 10). This provides a recovery option if something goes wrong. How to recover user files deleted by Windows 10 Version 1809 during upgrade from Softpedia. Softpedia recommends using the free Recuva recovery software. Download it from the developer's builds page. If Recuva is unsuccessful, try Acronis Revive (US$49.99) to restore your deleted files. Yet another file deletion bug hit Windows 10's October Update, this time affecting the safety mechanisms of the Zip file compression settings. Windows 10 October 2018 Update: New .ZIP bug could lead to data loss, admits Microsoft. Once more with feeling: Windows 10 October 2018 Update inches closer to relaunch. Windows 10 October 2018 Update: everything we know about Redstone 5. Microsoft needs to refocus on Windows 10 fundamentals, not just new features. Windows 10 continues to be updated. Check out the most recent features . Windows 10 April 2019 Update: The new features that matter most provides a preview of the next update. Support for third-party browser addins such as ActiveX, Java, etc. are not available in Edge because of the vulnerabilities they introduce. Flash (a vulnerable and dying technology) can be disabled in Edge's settings. Some reviewers were disappointed in what they see in Edge but it is a definite improvement over Internet Explorer. Performance has improved over time with updates to Windows 10. Promised browser extensions have been slow in coming (there were 21 last time I checked and you had to be running the most recent version of Windows 10). With the Creators Update, Edge became the only browser capable of downloading Netflix at 4K resolution although I expect other browsers to add the same capability at some point. Microsoft's going to rebuild Edge with Google's Chromium. If Continuum recognizes that a keyboard is installed Windows 10 automatically switches to the desktop mode. In Windows 10 desktop mode, apps can be windowed and resized (unlike Windows 8 which ran everything full screen). The integration of Xbox with Windows 10 will allow gamers to play their Xbox games on their PC. It cannot be uninstalled. Xbox is the portal to all of Microsoft's entertainment offerings: the movies you can rent or buy and the Groove music services they hope you'll subscribe to. Like Windows 10, Xbox is tied to an online account using your Microsoft ID and provides the ability to play online with friends. Playing “as a guest” serves video ads lasting up to 60 seconds between games (you can pay to disable them). These instructions on removing Windows 10's bloatware include links to two freeware apps (10AppsManager Read more at: https://tr.im/1XhJe and WXAR) that can remove Xbox and other unwanted Win10 apps. Your mileage may vary. Microsoft's Windows 10 specifications are similar to those for Windows 7. Some features require additional or newer hardware. Microsoft's list of Windows 10 features. It is hard to justify these prices when providing what Google does for free and exacting the same costs in terms of advertising and privacy. See which features come with each Windows 10 Edition. Additional features available in Pro include BitLocker encryption (see Encryption: Protecting Your Data), Remote Access, and the ability to run Hyper-V virtualization on your PC. Some features require special hardware. Shortcut keys for Windows 10 (MS Word document). Tips, tricks and shortcuts: Ed Bott makes Windows 10 work for you. Personalizing Windows involves changing the way Windows 10 does certain tasks or displays its content. You'll want to make Windows 10 your own. Click on the Start button then Settings then Personalization (or right-click the desktop and choose Personalize. Personalization has options to change your desktop and lock screen background (shown above), how the Start menu is configured and more. I recommend pinning only the most frequently used apps on the taskbar. Unpin the Microsoft defaults you don't want or use then choose what works for you. There are several new icons on the right side of the taskbar including Task View (next to Search), Notifications and a new way of displaying the language bar. Windows 10 uses Settings to manage much of what was contained in the Control Panel in earlier versions of Windows, including Personalization. The Settings panel includes System, Devices, Network & Internet, Personalization, Accounts, Time & Language, Ease of Access, Privacy and Update & Security categories. The majority of settings are found under the Settings (listed in the Start menu). If you don't find the setting you're looking for, try searching using the “Find a setting” search box. For example, I found that I needed to search for “advanced printer setup” when installing a networked printer when the default Devices settings couldn't locate it. Right-clicking the Start icon allows you to see a list of useful configuration options like Programs and Options, Device Manager, System, Disk Management and Control Panel without resorting to searching. 5 ways to make Windows 10 act like Windows 7 (registration required). In Windows 10 you have much more control over how your computer starts and the transition is much smoother. 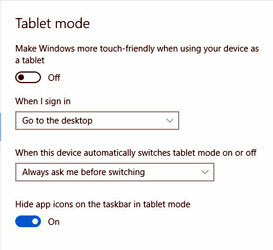 You can switch between tablet mode and desktop mode. In tablet mode the appearance and function is much like Windows 8.1 with the large “Modern” touch interface dominating the look and feel. In desktop mode the Start menu uses a combination of some Windows 7 features but pinned apps are displayed on the right as smaller (and configurable) “Modern” style tiles. I'm a keyboard and mouse user and don't run Windows on a touch-enabled device. I neither like the “Modern” interface nor find is useful. I've noticed many that do are more likely to search for programs and settings than to look for them in a menu. You'll need to customize your experience for what works best for you and your hardware. Wireless and Location are selected. I have set my older laptop for maximum performance, which would explain the grayed out Battery Saver button. The Flight and Tablet modes (normal on smart phones but unusual on computers) demonstrate the cross-platform nature of Windows 10. The Start menu can be customized to remove Most Used and Recently Added apps. I found these worked poorly in recording frequent use of non-Microsoft apps, but hopefully that will change. Start menu tiles (pinned apps) can be resized and live tiles turned off. 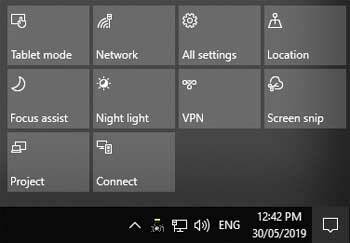 There is a setting to extend the Start menu to show more apps in Settings. Pinned third-party apps are not handled as well as Microsoft apps, particularly when displayed in the smallest size. This may improve for currently-supported apps as developers tweak for Windows 10 requirements but Microsoft benefits if you relent and use their new monetized apps. Microsoft made a lot of fuss about the return of the Start button, but let's face it, it is nothing like Windows 7 and barely useful (you'll probably find yourself going back to dumping program icons on the desktop). Start10 from Stardock ($4.99 — included with Stardock's Object Desktop) recreates the Windows 7 style menu in Windows 10. Classic Shell (free) provides Windows 10 with a Start button plus other enhancements. 6 ways to hack & customize the Windows 10 Start Menu. The task bar can be customized to show or hide certain icons and you can pin applications to it. One of the first changes I made was to remove the huge search box next to the Start button. Right-clicking on the taskbar brought up a menu. Click on Search and you see three options: Hidden, Show search icon and Show search box (the default). I elected to use the search icon option. If you install Cortana, it replaces these search options. Hidden tricks inside Windows 10. Windows 10 Settings menu: The Personalization tab. How to master the all-new Windows 10 Start Menu. Get to the task at hand with these Windows 10 taskbar tips. Microsoft requires a Microsoft account for access to the Microsoft Store and for other services like playing games in Xbox. This requires that you accept the Microsoft Services Agreement, a 12,000-word document where you essentially agree to give up your privacy. By signing in with a Microsoft Account, you earn Xbox Live Achievements, view Leaderboards, and save your game data in the cloud. Are you sure? You can allow a family member or other user to use your computer with assigned access. They need to sign in with their Microsoft Account which provides access to their own data (assuming the user's data is in the cloud or on a removable device attached to your device). Even if this isn't a big deal to you, Microsoft is still using your bandwidth to upload all this telemetry data. Continuing cash flow for Microsoft is an obvious plus and consumers will always get the latest and greatest without making a major purchase. Like mobile phone contracts, it assumes that you'll gladly trade in your computer every two or three years and that you're willing to sacrifice your privacy for very little in return. Many of the Microsoft Windows 10 apps could more accurately be called “freemium” rather than free. Advertising is built into the Microsoft Solitaire, News, Money and Weather and other apps. the Microsoft Solitaire Collection contains ads which can be disabled for US$1.49 per month or US$9.99 per year (more in Canada). How Windows 10 ruined Solitaire. Cortana ramps up Bing's market share with every search you make. OneDrive backs up everything to the cloud, and of course you can buy more storage space if you need it. The Video, Groove Music, and Xbox apps encourage entertainment purchases through Microsoft. The new Edge browser and the very operating system itself track you to serve targeted ads. 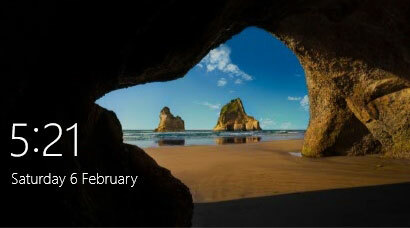 The free Office apps encourage paid Office 365 subscriptions to unlock full functionality. Underneath it all, the Windows Store is the repository for all of Microsoft's vaunted universal apps (and plenty of other things to buy). The fact that Windows 10 collects a lot of personal information has significant privacy issues, particularly in how your private information is used. Privacy is a basic human need and has nothing to do with having something to hide. Unlike an erroneous credit card purchase, you can't simply undo the loss of privacy information. Once it is collected, it is extremely unlikely that it can be expunged. Microsoft has been reluctant to get too specific about the sorts of data it collects and the mechanisms used. Maybe they have something to hide. If you purchased a computer with Windows 10 pre-installed or chose the default options when installing Windows 10 then chances are every privacy protection is disabled by default. The alternatives are displayed in much smaller fonts and often are not clearly labelled to enable you to make an informed decision even if you do notice them. Often when updating Windows 10 (now mandatory) you'll find that these low-privacy defaults have been restored along with restoring the Microsoft apps as default rather than your chosen (and probably safer) alternatives. Remember, Microsoft is planning on making money the same way Gmail and other free Webmail vendors do — by culling and marketing your profile to advertisers. More recently, Microsoft has tried to be more forthcoming with Privacy at Microsoft and Windows 10 and Your Online Services. These pages indicate how Windows 10 collects information and what it is used for. I suspect that the data you share online and keep in your OneDrive is more vulnerable to this, but Windows 10 is a “mobile-first, cloud-first” operating system and will try to store information there first. By default, Microsoft sets all the privacy settings to ON, collecting everything and allowing apps to have access to your contacts, mail and more. Google, Facebook, and Microsoft are spying on you — here is the proof! Windows 10 stores data on app use even if you disable activity history. Is Windows 10 still telling Microsoft what you're doing even if you don't want it to? 5 privacy settings you should change in Windows 10. Microsoft doesn't necessarily retain your privacy choices when installing the now non-optional updates. Spybot Anti-Beacon allows you to make significant choices about your Windows 10 privacy settings including many that are hidden or not easily altered. It immunizes your computer so you can check then reset your privacy settings after rebooting your computer (particularly after a Windows Update). Microsoft has begun to respond to these issues. On January 10, 2017 a new web-based privacy dashboard was released where you could manage your browse data, clear your search history on Bing, review and clear your location data and edit Cortana knows about you. With Windows 10, Microsoft blatantly disregards user choice and privacy — Electronic Frontier Foundation. Windows 10 personal data collection is excessive, French privacy watchdog warns. 30 ways your Windows 10 computer phones home to Microsoft. Microsoft's Windows 10 and privacy. Even when told not to, Windows 10 just can't stop talking to Microsoft. Microsoft admits Windows 10 automatic spying cannot be stopped. The real price of Windows 10 is your privacy. Windows 10: How much of my personal information can Microsoft access? It is likely that much of this information is already collected on your mobile device under your current terms of service. Corporations have taken advantage of our ignorance to gather our personal information for profit. Many ask for access to your contacts, even if there is no functional reason to do so (flashlight apps in Apple's iOS are an example). It is partly our own fault for blindly accepting the sorts of privacy invasions that Facebook, Gmail and other services extort as the price for their “free” products. However, many of us keep much more critical and private information on our PCs than on our mobile devices. As such, leaks can have much more serious repercussions. To their credit, Microsoft successfully fought the U.S. government's attempts to obtain non-U.S. customer data stored off-shore in Ireland. This may have had more to do with meeting tougher European privacy rules than protecting North American customers. Whatever you allow Microsoft to store or process for you may be provided to the government and the vetting process (i.e. court order requirements) are often circumvented or simply a rubber stamp from a secret court. Even Congress has no real knowledge of how the process works and what is actually being collected by their spy agencies. Cortana, like Siri and Google Now, is a surprisingly effective virtual assistant. However, accuracy comes at a price — your privacy. Accuracy requires a lot of very personal information about your calendar, contacts, habits, relationships, current location, likes, dislikes, etc. Because you're signed into your Microsoft Account, nothing is anonymous. So how do you protect your privacy in Windows 10? One of the first things you'll want to do is to make changes to the default settings. Some of these settings are chosen during the installation process. The others can be modified. You might not be able to control all the privacy settings but you should reset the ones that you can. As with Facebook, updates to Windows 10 may change the way you control privacy or even undo privacy choices you've made in the past. The advertising ID is a unique identifier that helps to provide “personalized” ads (i.e. ads that are based upon sites you've visited, etc.). The “about how I write” allows Microsoft to track your keystrokes. You'll also want to click on the “Manage my Microsoft advertising and other personalization info” link and look at the settings for each of the browsers installed on your Windows 10 computer to change those privacy settings. By default, Microsoft will obtain updates not just from their servers but can also share them from other computers on your network or the Internet. The latter is not a good idea from a security point of view. Click on Settings then open Updates & Security. Click on Advanced Options then Choose How Updates are Delivered. Turn off Updates from more than one place. If you're using wireless you can also limit the downloads of Updates by indicating that you're on a metered connection. This won't work for LAN (non-wireless) connections. Cortana requires a lot of personal information to be most effective, but it comes at a cost. Taming Cortana became harder after the Anniversary Update. The data you provide will be used to personalize advertising. The term “personalize” is a euphemism for profiling. This data will make it more likely that you'll click on ads (and your personal profile data can be sold to others). Change Cortana's settings to reduce what you provide or turn it off altogether. How to disable Windows 10 data collection. How to reclaim your privacy in Windows 10, piece by piece. Fixing Windows 10's privacy problems. The Windows 10 privacy settings you need to change right now. How to stop Windows 10's prying eyes. How to secure Windows 10: The paranoid's guide. Windows 10 doesn't offer much privacy by default: Here's how to fix it. Digging into and understanding Windows 10's privacy settings. How to configure Windows 10 to protect your privacy. Windows 10 is spying on almost everything you do: here's how to opt out. Want Windows 10 to stop tracking you? Now there's an app for that. Setting your preferences for Windows 10 services. Windows 10 and your online services. I'd recommend that you can sign in with a local account unless you need to move your work between multiple devices (and have considered the privacy implications). Should you use a local or a Microsoft account in Windows 10? is a tutorial that can help you evaluate your choices. A local account limits or removes many of the capabilities of Windows 10 including personalized searches, effective use of Cortana and the ability to continue your current work on another device even if the data is stored in the cloud. You will probably find that you don't need all these features but you will better preserve your privacy. Microsoft tells you how to create a secondary Local Account (one in addition to your Microsoft Account) but that still leaves you vulnerable, at least when logged into the Microsoft Account. Windows 10 doesn't make it easy or obvious to create a secondary local account, but all it really takes is looking for the fine print ( PCWorld ). Setting up a local user account in Windows 10 (Video from PCWorld ). Create a local account In Windows 10. To preserve your privacy you'll need to do a clean install with only a local account after you've obtained your Windows 10 upgrade. Install Windows 10 with a local account. How to set up a local account in Windows 10 during or after installation. After Microsoft's “Scroogled” campaign, they proceeded to do exactly what they accused Goggle of doing. If you have a Gmail account and use Google Chrome as your default browser, then you've already given up much of your privacy, particularly if you've signed into your Google Account while browsing. Remember, unlike Gmail and similar services where you're exchanging your information for a free service, Windows 10 is NOT free, even if you took advantage of the free upgrade from Windows 7 or 8.1. Your data is stored in the cloud on Microsoft OneDrive (formerly SkyDrive) by default rather than on your computer but this setting can be configured to save data only on the computer. Apps like Mail and Calendar can access other cloud services like your iCloud or Gmail accounts. Microsoft is responding to the demand for “anywhere, any time, any device” access but will benefit greatly by monetizing the data they'll collect as a result. Cloud based information is accessible from anywhere with anyone having your login credentials. More significantly, once data is in the cloud you no longer completely control what happens to your personal information or how it is used. You should also be aware of issues with security when using free WiFi unless you're using a VPN. More about VPNs. The companies collecting your personal data are willing to spend less on securing your data than what they spend protecting their own data. This won't change until the cost of being hacked is more than the cost of the necessary security upgrades. Windows 10 is touted as the most secure Windows yet. Better Security at What Price? Microsoft boasts that Windows 10 is the most secure ever, but part of that may be its ability to know exactly what is running on your computer — your applications and data. The sort of information that Microsoft collects is disturbing and can be shared with “unnamed partners” according to the Microsoft Services Agreement. Who are these unnamed “trusted partners” referred to by Microsoft? How Windows 10 data collection trades privacy for security. U.S. agencies said to swap data with thousands of firms. The Free Software Foundation's statement on Windows 10. Microsoft's new small print — how your personal data is (ab)used (June 17, 2015). While improved, Windows Defender isn't enough. Windows 10 has a significantly more secure architecture and is also better equipped than its previous versions. Nonetheless, good security software is absolutely essential. While Windows Defender offers decent antimalware support, to protect your system you need a security suit. Continual (non-optional) updates greatly improve overall security but can also force updates that are undesirable because the engineers at Microsoft count on a uniform platform in a Windows as a Service environment. Windows 10 may even evolve to have undesirable features without your permission. Because Windows 10 Updates are an all-or-nothing deal, there are a couple of problems. Microsoft has released disastrous updates in the past (even on Windows 10). A bad update cannot be singled out for removal. You can't uninstall only one of the updates installed each month. Major updates like the Anniversary Update can take considerable time to download and install. If this happens in the middle of your workday or an important project that could be much more than inconvenient. Microsoft insists on restoring their apps as defaults after major updates. Not cool. Users wanting to use third party apps should be free to do so. You can use System Restore to recover from a bad update, but you'll have to turn on System Restore in Windows 10 before that happens. Ability to Delay Updates Coming? Depending upon the version of Windows 10 you have and on changes brought about by the major updates, you may allow you to delay updates for up to a year. Because the Microsoft ID is an online login ID, a very long, random and complex password is necessary. This makes logging in prone to “fat finger” errors. The option to reveal what you've typed can guard against entry errors but doesn't help your memory. Thankfully, an option to use a 4-digit PIN is available. The PIN only works on the current device (it is not a universal replacement for your password). Windows Hello provides a secure method of replacing passwords with biometric verification, provided you have the supporting hardware. Unfortunately, that hardware is rare on consumer-class computers except for Microsoft's Surface machines. any suspicious activity leads Microsoft to believe someone else might be using the computer or signed into your account. The two-factor verification includes options to email or text special codes to an already-registered email address or phone number for your Microsoft Account. Two-factor verification is only available when signed in with your Microsoft Account (but not to Local Accounts). See About two-step verification for more information. Learn more about protecting your PC while running Windows 10. Microsoft's Protect Your PC . 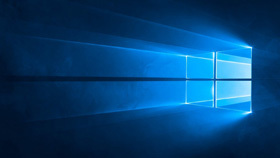 Windows 10: three security features to know about. If you're using Windows 7, I'd recommend that you carefully re-assess an upgrade to Windows 10. Given that Windows 7 has less than one year of support remaining, you will want to re-evaluate your options. Whether it's worth upgrading now depends on what sort of PC you have, but the more mobile, the better. If you have an old desktop PC with no touchscreen, no camera and no microphone, there are fewer benefits. Many of the newest features in Windows 10 are not supported by the hardware that was around when Windows 7 was released. Few computers other than the Microsoft Surface would do all of what Windows 10 promised when it was released. However, other manufacturers now release computers more suited to Windows 10 and its special requirements. The newest features in Windows 10 like Hello and Ink are unlikely to be supported by older hardware. Microsoft's Universal Windows Platform still needs much work. Microsoft's own apps, including Edge, are generally poorer than alternatives. Some older peripherals (printers, scanners, etc.) may never have Windows 10 drivers developed. However, if you upgrade to the newest hardware, you may have no choice. Unlike its predecessors, Windows 10 is Software as a Service, aggressively collects personal information and is heavily monetized. Microsoft has consistently fallen short in keeping their promises about Windows 10. See 10 reasons you shouldn't upgrade to Windows 10 (slide show) for other trade-offs and shortcomings. Xbox gamers may think Xbox is great, but it cannot be uninstalled (it is a key component of Microsoft's money-generating multimedia offerings). These instructions on removing Windows 10's bloatware (including Xbox) may work for you but you might also create issues with future updates to Windows 10 which tend to reinstall default apps. Many of the “improvements” in Windows 10 had more to do with fixing issues with Windows 8 than providing improvements to Windows 7. The Windows 10 Start Menu tiles are suitable for touch screens. Windows 7's Start Menu works better for mouse & keyboard users. While features like Libraries are available, they are not enabled by default. The new Quick Access replaced Libraries, but might not be what you want. That said, the various Creators Updates have added much new functionality to Windows — provided it is supported by your hardware. Windows 10 vs Windows 7 - Should you upgrade? 10 hurdles to Windows 10 adoption. Windows 10 tour: The good, the bad, and the missing. I suggest you take some precautions before beginning the upgrade process. Prepare for the worst by backing up your data to an external drive or other reliable media. If the upgrade fails, you may have no other copy of important data and program settings. The upgrade assistant will advise you whether your hardware is capable and if any programs will not be able to run under Windows 10 but the process is not perfect. People have experienced catastrophic failures during the upgrade process, including losing the ability to boot the computer at all. In such cases you can try to do a clean install of Windows 10 or your previous Windows version. In either case you're going to need those backups. I recommend that you remove all unnecessary applications, backup your data to an external drive and ensure that all essential Windows Updates and hardware updates are installed before upgrading. After 30 days the restore files are deleted and you'll need to do a clean install of your previous Windows installation and programs. There have been cases where the recovery files were somehow deleted prior to 30 days. A clean install is where the hard drive is wiped and the base operating system is installed then updates applied then programs reinstalled and data restored. Because your drive is wiped, issues with broken drivers, missing files, incorrect settings, malware and other problems will be dealt with. Care must be taken to ensure that boot-sector viruses aren't present. This can be a long and tedious process with hundreds of updates to restore as well as your programs and data and their settings. If you've lost the recovery media for your computer or never created it in the first place it may be impossible for you to recover your system. You'll need to determine that your backups are intact and complete before beginning this process. If you've lost the installation media for your programs you may need to purchase them again. It also provides the option for a Windows 10 local account, which is less likely to send your private information to Microsoft — if you make the correct choices during setup. You can immediately download the Windows 10 upgrade, activating it by providing a legitimate Windows 10 license key. Download Windows 10 from Microsoft. How to get Windows 10 for free. Your crash course in Windows 10, from installation to personalization. Windows 10 Clean Install using the Media Creation Tool. The top 5 areas to update after you upgrade. 5 common problems people are having with Windows 10 and how to fix them.